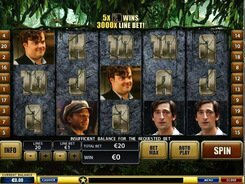 Rocky is yet another Playtech-developed slot machine based on a famous film. 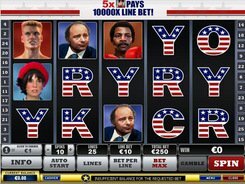 The five-reel 25-payline video slot features the following symbols: letters R, O, C, K and Y, Ivan Drago, Clubber Lang, Apollo Creed, Rocky, and some other themed icons. 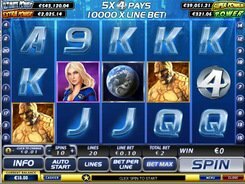 Before spinning the reels, you should select the number of lines you will bet on and then make a bet. The wager per bet varies from $1 to $200. The wild symbol is represented by Rocky himself. 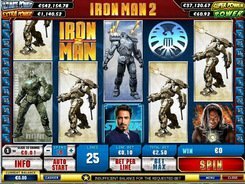 It can bring you a win of up to 10,000 coins. 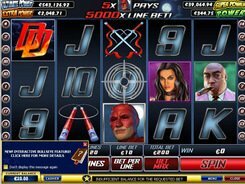 The maximum award is given for five Rocky symbols on an enabled payline. Even a single wild symbol can yield benefit for you since it substitutes for other icons. The Rocky Italian Stallion is the scatter that triggers free spins depending on the number of scatters that have occurred on the reels. Three, four and five scatters give you 15, 20 and 25 free games, respectively. 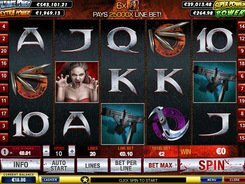 During the free spins round the x2 multiplier is applied. 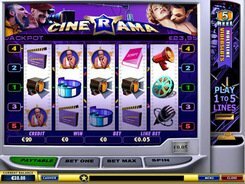 If letters R, O, C, K and Y appear across all the reels in that order forming the name ROCKY, you win x5 times your bet. If red and white boxing gloves drop on reel #1 and #5, you start the bonus game. Before the fight, you should select one of three boxers Rocky will fight against. Rocky should win as many of the 10 rounds as possible to provide you with a generous award. PLAY FOR REAL MONEY!